FSO is one of the many distributions that currently work on the Openmoko phones. You can compare a distribution with an Operating System on normal computers. It gives the phone all the software needed for operating. For more information about the different flavors, see distributions. 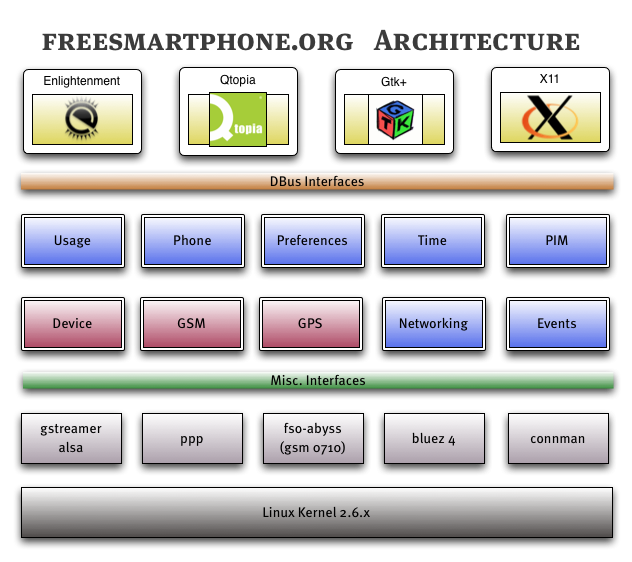 FSO is an abbreviation for FreeSmartphone.Org. With FSO, Openmoko is working on a stable system services software back-end. The framework will be used in forthcoming Openmoko distributions -- a demonstration one is available as FSO-image. For more information see http://www.freesmartphone.org and http://trac.freesmartphone.org . Question: Is this an Openmoko-only thing? Question: Is this a part of the current images yet? Is it perhaps the mystic ASU? Question: When can I see this as part of an image? Answer: Not before spring 2009. Question: What's the current status? Answer: See right below or hop over to http://trac.freesmartphone.org . Question: How do I work the Zhone (FSO demo app) UI? Question: What is the easiest way to build it? See Building_FSO for more information. Bootloader, Kernel, or System Init. Application Launchers, Applications, or Fancy UIs. We differentiate between low-level and high-level services -- dbus will be used to communicate horizontally and vertically. Turning LEDs on and off, etc. Gstreamer is to be used for all kinds of event sounds where a) multiple audio formats need to be supported and b) a latency of about one second is acceptable. This goes for e.g. ring tones, welcome tones, plug indication. The Usage subsystem is concerned with coordinating application I/O requirements. Applications are not supposed to turn on or off devices, since they do not have any knowledge about concurrent applications that may be also using the device -- think reference counting for I/O requirements. With this added layer, we could later think about monitoring subsystems, subsystem usage statistics, or accounting. See discussion page about PolicyKit. An intelligent storage database server. This is being carried out as a Google Summer of Code project. See complete description here. The phone subsystem can be used to create and manage voices communications. It makes abstraction of the protocol used. edit /etc/frameworkd.conf and add 'log_level = DEBUG' into the frameworkd section. Where we write new code, we will use Python to implement the dbus services. The reason for that being the rapid prototyping nature of Python and the emphasis on the dbus APIs. Using Python, the turnaround times to experiment with APIs are incredibly faster than for using a compiled language such as C or C++. Guillaume 'Charlie' Chereau -- Openmoko employee, working fulltime in the Openmoko office, Taipei, Taiwan. The milestone releases are combined Openmoko Framework and Zhone releases. Remember: A feature that isn't visible, working, and tested in our framework testing application (Zhone) does not exist. Until Framework 1.0.0 (later this year), we will not use any versioning in components. Afterwards, individual components may see individual releases. Note: The milestones and tasks moved over to our issue tracker.